As part of a large project sponsored by the Ontario Soil and Crop Improvement Association, Pioneer Hi-Bred, Syngenta, Bayer, Gustafson and CanAdapt, we are working on solutions to the following emerging or potentially emerging corn pests. Because of good crop rotation practices, corn rootworm is generally a minor concern in Ontario. Corn rootworm still causes localized problems where crop rotations may not be possible, such as on dairy farms. Normally, adult rootworm beetles deposit their eggs in corn. In the following spring, these eggs then hatch into larvae that feed on the roots of corn planted after corn. In Illinois and Indiana, a new strain of corn rootworm that lays eggs in other crops has become a significant problem in first-year corn since the late 1980s. It was discovered that rootworm beetles preferred to deposit eggs in soybean fields rather than in corn; the eggs then hatched the following year in corn planted after soybeans. This new type of the corn rootworm has spread eastward from Indiana, and by 1996, confirmed cases were reported in western Ohio. Some counties in southern Michigan are now also finding this new variant. Consequently, millions of hectares in these regions require insecticide treatment for corn following soybeans. Although we found some rootworm egg-laying in soybean and wheat fields between 1998 and 2001 in Ontario, the populations have been insignificant to date. We have been monitoring the situation each year and so far there is no evidence that this problem has reached Ontario. We have found genetic differences between normal adults and the soybean-adapted type collected in the U.S. We believe that the soybean-adapted rootworm may not pose an economic threat in Ontario because of higher diversity in both crop rotations and the landscape compared to that in the U.S. We are spearheading a regional project with Michigan, Ohio, Indiana and Illinois to test this question. With funding from CanAdapt, Ontario Corn Producers and other groups, we are seeking to develop methods to quickly identify the variant type of rootworm using genetics, and to identify conditions that lead to the development and spread of the soybean-adapted variant; this knowledge would be useful for assessing the potential for adaptation under Ontario conditions. European chafer is a new white grub that has threatened both corn and wheat on about 8000 hectares in Ontario each year since 2000. Chafers are most prevalent on sandy knolls, and are a new problem in wheat and corn, apparently spilling over from the turf industry. In turf, chafer white grubs have been with us for over twenty years. Management opportunities for controlling the pest include tillage before planting corn, delaying corn planting until the grubs become less active, or planting soybeans instead of corn. All of these management options, however, conflict with measures to control soil erosion and to maintain a proper crop rotation. Control is often unsatisfactory with existing insecticides. The new seed treatment, Poncho, is showing some promise, but is currently not available. Our preliminary data show that damage from chafers in corn may be minimal with populations of less than four chafers per square foot. Field surveys showed chafer populations are associated with soil texture and topography; chafer populations should be assessed on sandy knolls in a field. Black cutworm is a sporadic pest of corn; corn stands have been reduced by up to 90% in severe infestations. The first generation of moths migrate into Ontario from the U.S. in early spring; they are attracted to fields with heavy residue and green weed cover. Recently registered Herculex I corn hybrids provide moderate to high levels of protection against black cutworm. These hybrids express the Bt protein CRY 1F. In general, rescue treatments for controlling cutworm may be warranted when 3-5% of corn seedlings at the 2-leaf to 4-leaf stage have been cut below the ground. However, this threshold was developed with hybrids lacking resistance against cutworm; it is not clear whether rescue treatments are warranted with Herculex I hybrids. We are also finding some activity against black cutworm with Poncho seed treatment (see Figure 2), and are planning to look at how the Herculex I and Poncho might complement each other. Registration is expected in March 2003 for a seed treatment from Gustafson called Poncho  a suitable replacement for diazinon and lindane. Poncho will be available only for commercial application, so we are expecting that seed corn may be ordered this fall in time for the 2004 crop year. 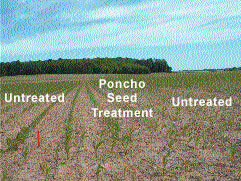 We studied the effectiveness of Poncho in commercial-scale strip trials across farm fields. Over 40 farm fields were targeted for the trials across southern Ontario; fields were chosen with expectations of high populations of either black cutworm, wireworm, European chafer or corn rootworm. 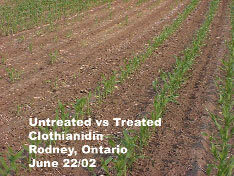 In general, the low rate of Poncho was sufficient to provide excellent control of wireworm (see Figure 1), while the high rate provided excellent protection against corn rootworm. Other research has noted that seed treatments containing diazinon and lindane were only 50% to 60% effective against wireworm; our results suggest that Poncho consistently provides between 80% and 90% control of wireworm. Based on our small-plot studies, we expect similar results against European chafer and black cutworm (see Figure 2) with Poncho; high infestations of these pests did not develop in our on-farm trials in 2002. Poncho also provides protection against seed corn maggot and corn flea beetle.